I’ve gone pumpkin-CRAZY! Seriously, it will come time for lunch and all I will want is some pumpkin sweets. My sweet tooth lately has been uncontrollable lately! 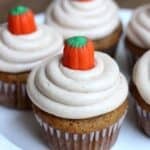 Between these Pumpkin Cookies with Caramel Frosting, my favorite Pumpkin Chocolate Chip Bread, and these Pumpkin Cupcakes with Cinnamon Cream Cheese Frosting I feel like I don’t need anything else to be completely satisfied for the rest of my life! These cupcakes are soo moist and light and fluffy. And the cinnamon cream cheese frosting—well, do I even need to say why THAT is amazing? I’ll just say it really does taste as good as it sounds! If you have people in your life that you love, you should make these for them. I think that should apply to everyone. So make them! You’ll be making the world a better place! In a large bowl, combine flour, pumpkin pie spice, baking powder, cinnamon, baking soda and salt. In a separate bowl combine pumpkin puree, sugars, vegetable oil and eggs. Pour mixture over dry ingredients and stir, just until moist. Scoop the batter evenly into prepared muffin tin. Bake for 15-18 minutes, or until a toothpick inserted in center comes out clean. Remove from oven and cool completely on a wire rack before frosting. Beat butter and cream cheese together until light and fluffy, 2-3 minutes. Add vanilla and cinnamon. Gradually add powdered sugar and beat until you reach the desired frosting stiffness that you want. 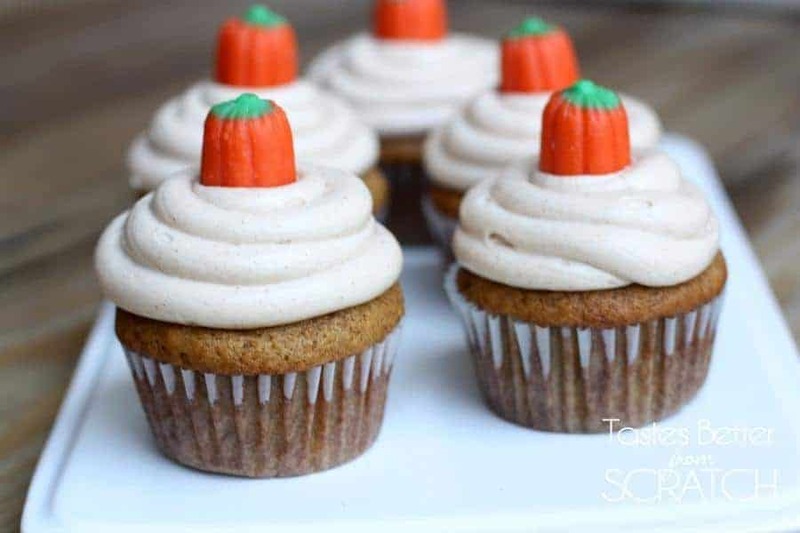 Frost the cupcakes and garnish with pumpkin candy, if desired. Mmm these cupcakes look dreamy! And I want to eat that frosting by the spoonful! Thanks Aimee 🙂 The frosting is killer! These look amazing! I am loving all the fall foods lately! Thanks Jessica! Fall is the best time of year for yummy foods like this!!! These cupcakes look and sound amazing! 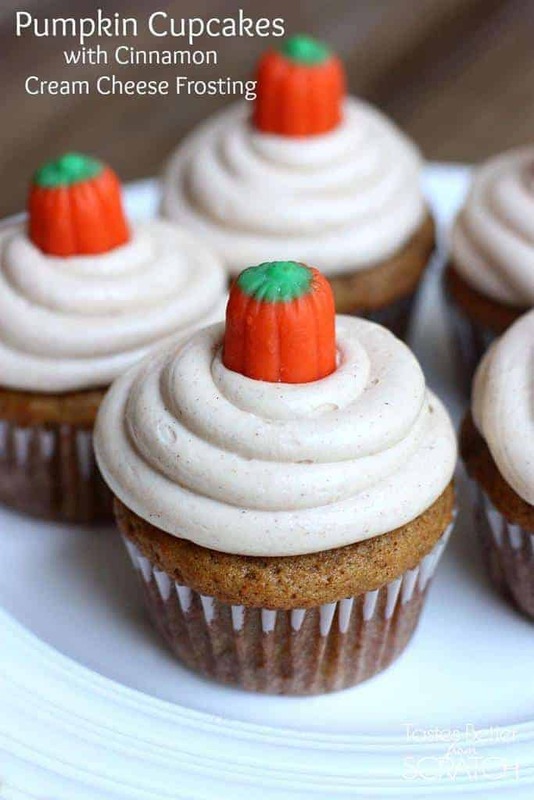 Nothing says Fall like pumpkin spice baked goods! Thanks Kaitlyn, I’d love to hear how you like them! I made these cupcakes, followed the recipe to the letter, and OMGOODNESS!! DELICIOUS!! The cream cheese frosting is the perfect touch! Although I did eat one cupcake without the frosting! My family loved these! Than you for sharing the recipe! Just made these! They rose PERFECTLY AND ALL THE SAME SIZE!! They are cooling right now but the batter tasted amazing! Can’t wait to decorate and eat! Thanks! !